Product prices and availability are accurate as of 2019-04-12 08:46:32 EDT and are subject to change. Any price and availability information displayed on http://www.amazon.com/ at the time of purchase will apply to the purchase of this product. 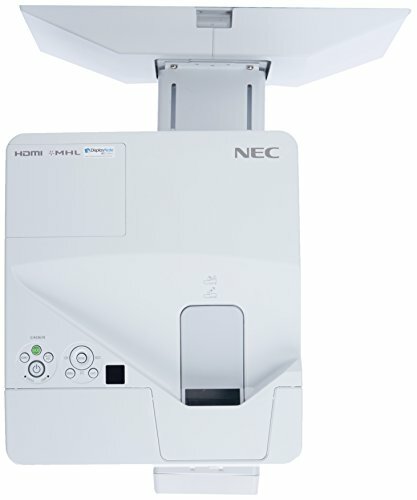 NEC’s UM361X-WK includes the 3600-lumen UM361X ultra short throw projector and NP04WK1 wall mount kit. This model delivers an extremely short throw distance for education and corporate applications. A complete interactive projector solution can be created using the optional NP03Wi interactive system (dual pens) with auto calibration. 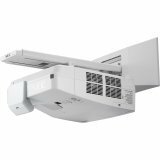 With its ability to be mounted to the wall directly above the screen on which it projects, this model helps eliminate the shadows and glare typically found with standard projection systems. The UM361X projector includes a powerful 20W speaker, closed captioning and RJ-45 for remote management over a network, and its input panel includes dual HDMI, VGA and a microphone input to amplify the presenter’s voice.